The War Room - April 2014 - She's Lost Control! We’ll start with the storage area up top. Little has changed. 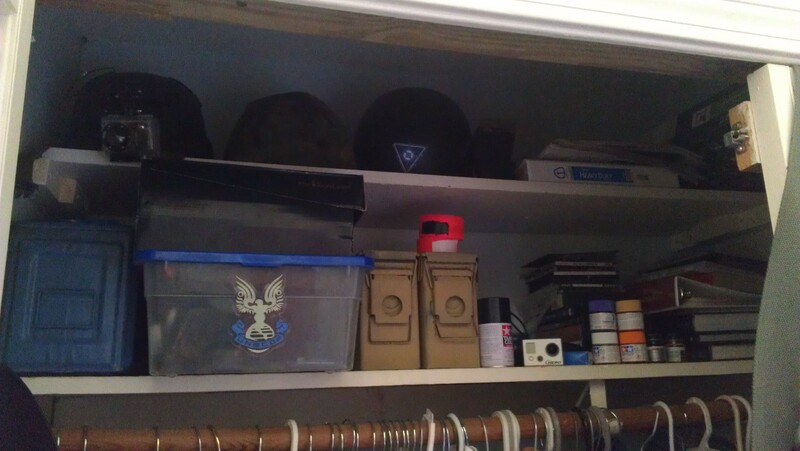 I’ve found a more permanent spot for the Rasbpberry Pi, and the two sets of polyurethane cat ears I used to store up here have both been sold, so they’re not there anymore. Also got a couple more paints. 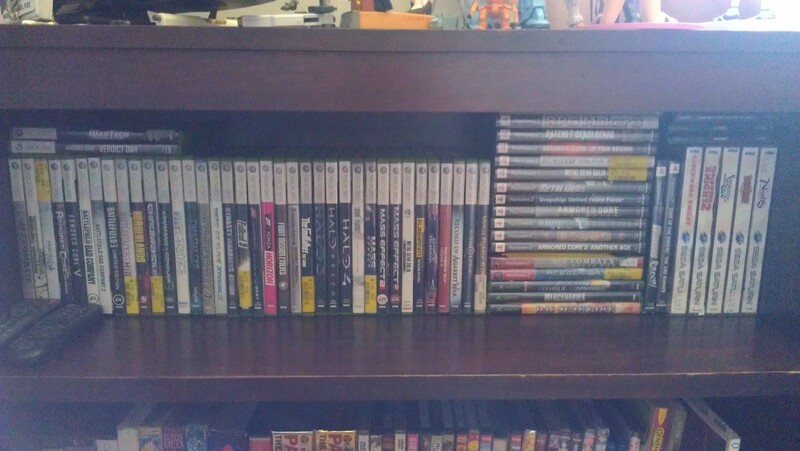 The game shelf hasn’t changed at all. 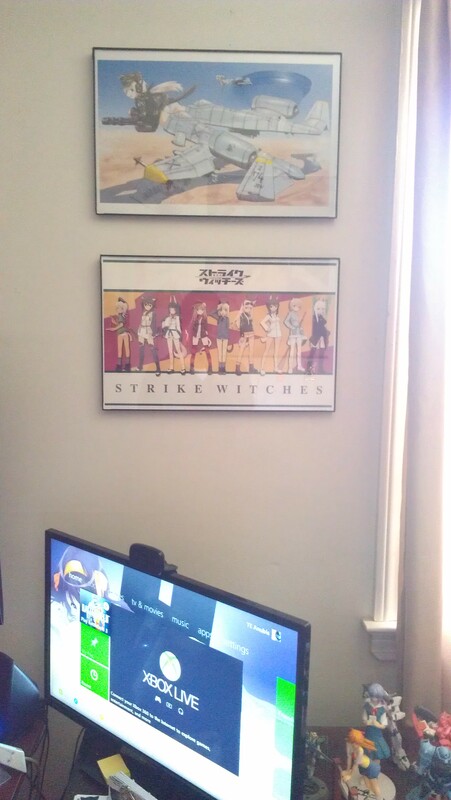 The anime shelf has, with the addition of both of the Strike Witches BD/DVD combo packs, Upotte! 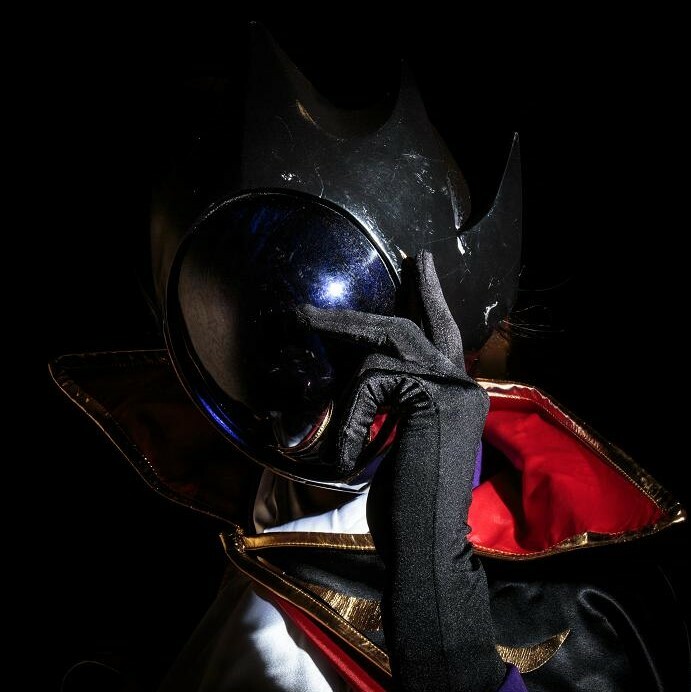 !, and Saya no Uta. …And this is where they moved to. 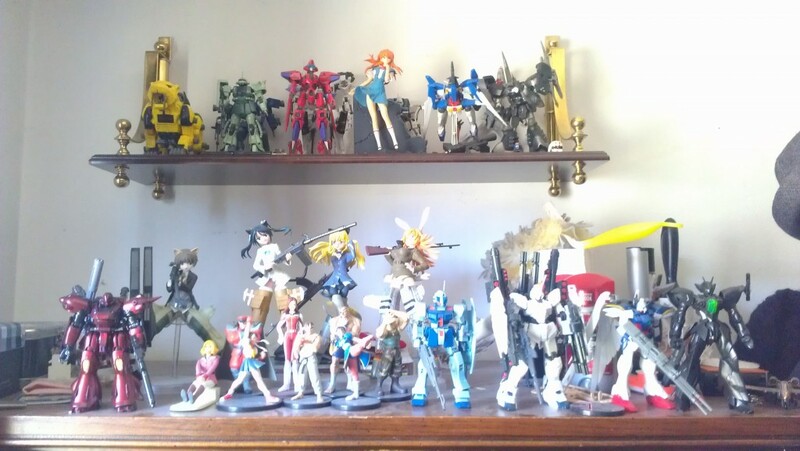 In addition, there’s also my newest Gundam model at the far left. 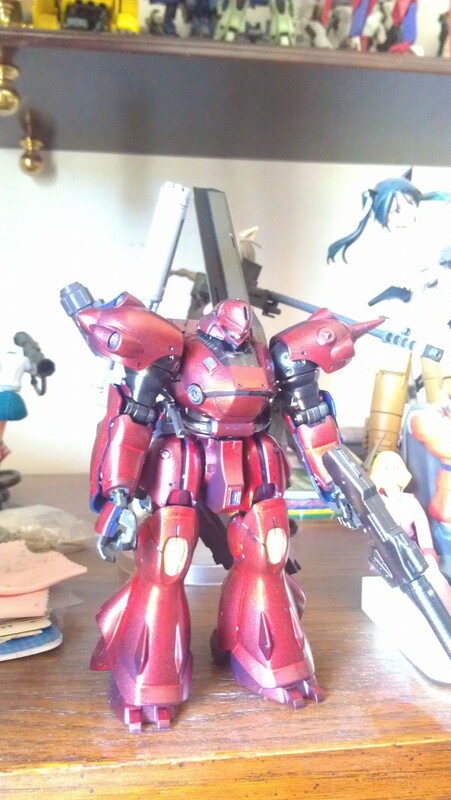 A custom-colored Kampfer Amazing (I call it the Kampfer Anubis) now resides where the Dra-C used to be. With its wealth of weapon hardpoints, it’s also somewhat of a holding repository for extra weapons from other models. You can see the Dra-C’s gatling gun behind its right shoulder. I also mounted the Full Armor Unicorn Gundam’s bazooka to the hardpoint on its lower back. 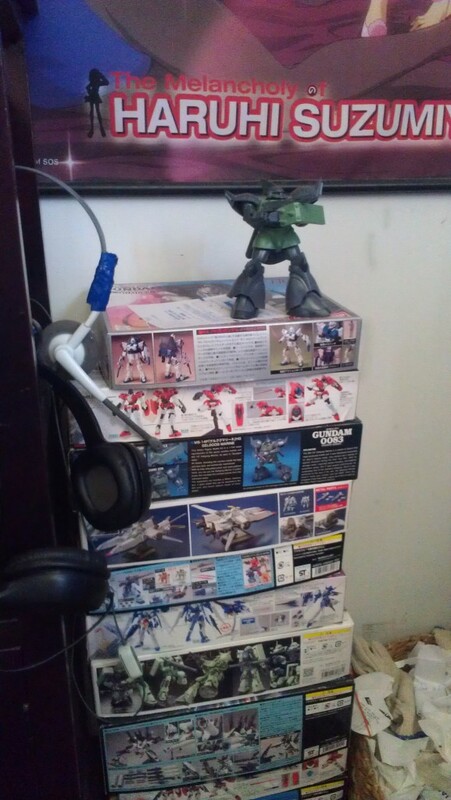 Speaking of Gundam models, all these boxes were taking up too much space in the closet, so I took them out of there and stacked them by my desk. Most of these still have extra hands and whatnot that I never took off of the runner, so I still need to go through them and see what I need to save. 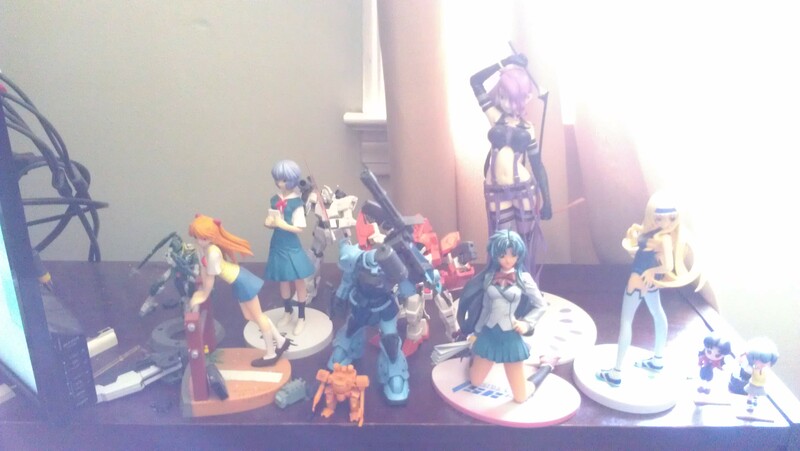 Also, I moved my Gelgoog Marine to stand guard on top. 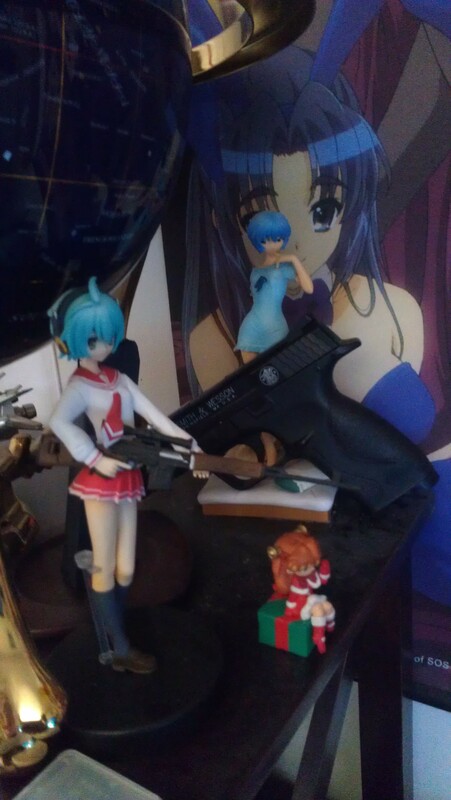 Reki, new from Anime Boston, helps Rei to guard my airsoft pistol. This area’s changed quite a bit. 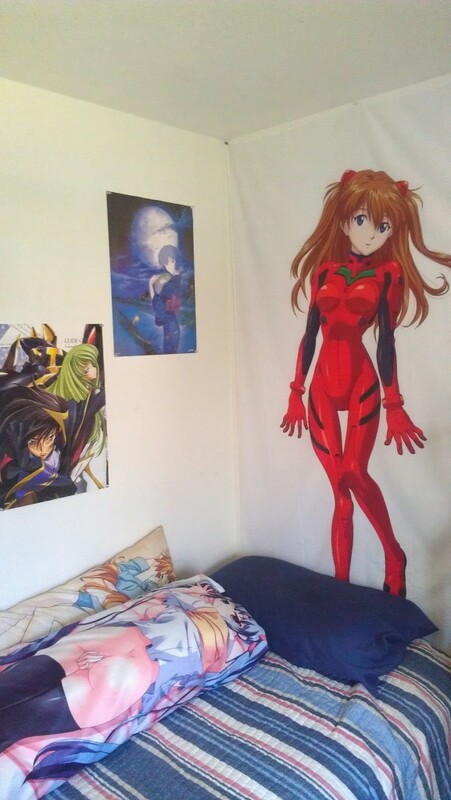 I replaced the Europe map with a Code Geass poster and a Rei Ayanami poster, and the Asuka bedsheet has moved here, as well. Further down the wall to the left, nothing has changed apart from the JAM Project paper fan up top. 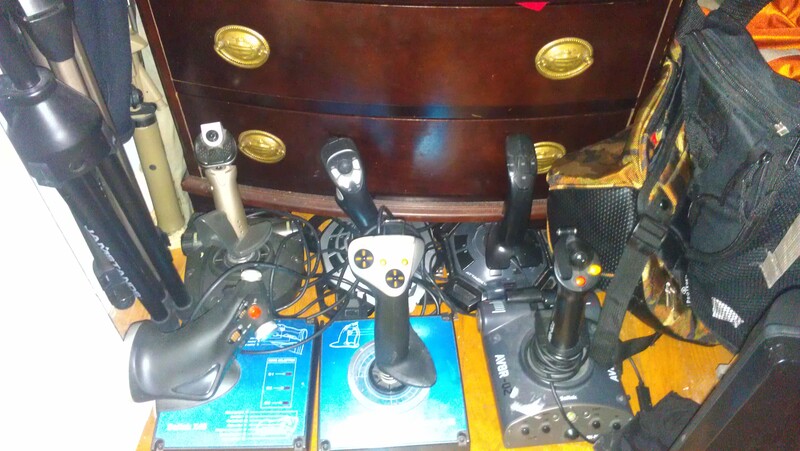 At the very bottom of my closet, I keep my assortment of flightsticks. The game consoles and MIRA (The PC tower) stay underneath the desk. 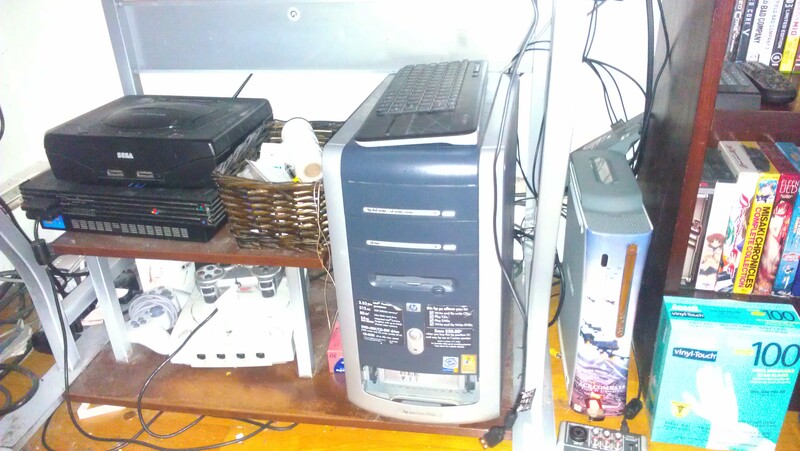 The Xbox has also moved to the gap between the desk and the bookcase, so I don’t have to lower the lid of the laptop to switch out games or harddrives. Other consoles include my doo-doo 1st-gen PS2 and my infinitely more reliable Sega Saturn and Dreamcast (Though the Saturn needs a new internal memory battery). 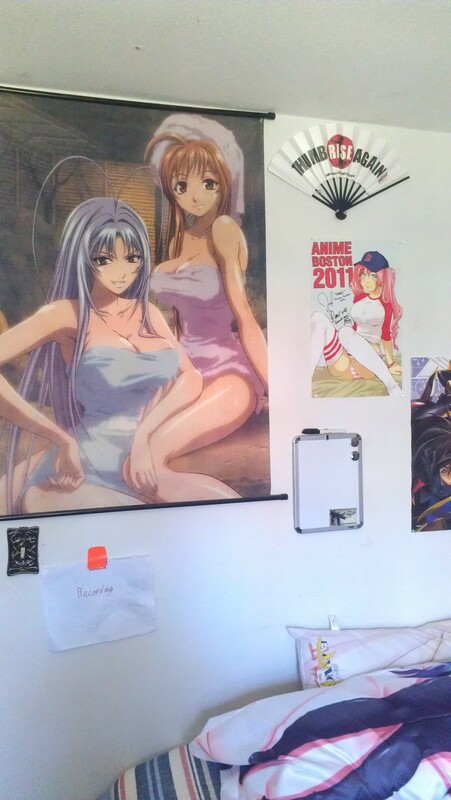 Here’s where those Strike Witches posters ended up. The biggest change to the War Room since last time: The wall-mounted TV. A lot of shifts were made to accommodate this thing, but everything came out infinitely better because of it. 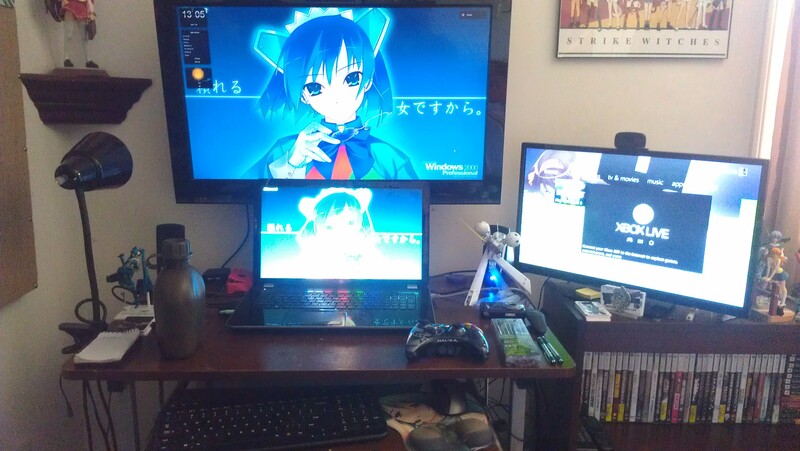 I’ve got a ton more desk space and the entire setup just generally looks cleaner. The Dra-C is stationed here now, and the Raspberry Pi now stays toward the rear of the desk. The old laptop monitor TV is now the new gaming TV. Nice! Really like the Kampfer model.